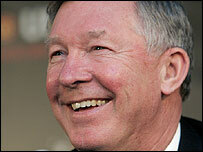 West Ham striker Carlos Tevez is set to join Manchester United, BBC sports editor Mihir Bose understands. The discussions are under way and Tevez may move on loan or permanently to the Premier League champions. Tevez, 23, is currently on international duty with Argentina in the Copa America in Venezuela. West Ham have said they want to keep him after he helped them survive in the top flight last season but doubts have remained over his Hammers future. "I understand talks have been going on for several weeks now," added Bose. "Manchester United are certainly very keen on Carlos Tevez but they are very complicated talks because of the nature of the loan arrangement he has at West Ham. "What is going on is whether he goes on a permanent move, which would involve a very high fee. Certainly, Tevez's people would want in the region of what Zinedine Zidane went for when he moved to Real Madrid - about £40m. "Or he could go on the same arrangement his colleague Javier Mascherano went to Liverpool under when he left West Ham. That was a two-year deal and a sort of extended loan for a much lower fee." There was much controversy over the signing of Tevez and that of fellow Argentine Javier Mascherano by the Upton Park club last summer. West Ham were fined £5.5m for irregularities that centred on who owned the players' contracts but Sheffield United, who were relegated from the Premiership in the 2006-2007 campaign, believe the London club should have been docked points. An arbitration panel this week upheld a decision not to deduct points from the Hammers but the Blades are investigating whether they can appeal to the civil courts. 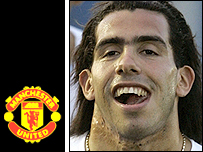 All through the saga, Tevez refused to let the situation have an adverse toll on him. Instead, at the end of last season he inspired the Hammers to a run of form that lifted the club out of the bottom three and clinched their top-flight status. When Tevez first arrived at Upton Park he found games hard to come by under the then West Ham boss Alan Pardew but he was given a more prominent role after Alan Curbishley took the helm in December 2006. Last season Tevez scored seven goals in his final 10 Premier League games, including the winner at Manchester United that guaranteed West Ham's survival. He was expected to delay a decision over his future until after the Copa America finishes on 14 July but United appear to be keen to tie up a deal for the player. Arsenal and Liverpool were also linked with Tevez, who turned down a move to Italian side Inter Milan after failing to meet a deadline they set for him to make a decision about whether to join them. If Tevez did sign for United he would join the Old Trafford outfit's other summer recruits in England midfielder Owen Hargreaves, Portugal winger Nani, Brazilian midfielder Anderson and keeper Tomasz Kuszczak.